Yuka Saso of the Philippines hits a shot during the women's golf competition of the 18th Asian Games at the Pondok Indah Golf & Country Club near Jakarta, Indonesia. JAKARTA -- Yuka Saso delivered the Philippines' second gold medal of the 18th Asian Games in dramatic fashion. After recovering from a double-bogey mishap on the 17th hole with a superb eagle on the 18th, Saso watched leader Liu Wenbo of China collapse with a fat 9 on the 18th to win by three strokes. Saso, just 17, looked headed for either a silver or a bronze after entering the final hole two shots off Liu. But she eagled the par 5 18th while Liu shot a four-over 9, allowing the Fil-Japanese teenager to steal the win. Saso opened the four-day tournament with a 1-under 71 and moved into contention with back-to-back 3-under 69s to enter the final playing day with a three-day total of 7-under 209, just a stroke behind China's Du Mohan and four adrift of Liu . She moved into a share of the lead with back-to-back birdies on the 12th and 13th but a costly double bogey on the 17th, which Liu birdied, dropped her back three strokes heading into the final hole. But Saso reached the par-5 18th with just two strokes and then nailed a tough eagle with a putt from around 10 feet to finish with a six-under 66 and a four-day total of 16-under par 272 as the crowd, which included a number of Philippine sports officials, erupted in cheers. "I know that my putting was working well today but my shots off the tee were kind of struggling," Saso told Paolo Del Rosario of Hyper. "But I still had a lot of confidence in myself. Just seeing the whole delegation walk with me, that was very inspiring. I tried to stay confident because I'm representing the country and that's something I really love doing." Liu settled for the silver with a 275 while Bianca Pagdanganan beat Japan's Ayaka Furue in a playoff to get the bronze. Both finished at nine-under 279. Du shot a two-over 74 to bow out of medal contention. And with Pangdangan also shooting a final day 66, the women's team also snatched the gold in the team event, making it a double gold for the squad. 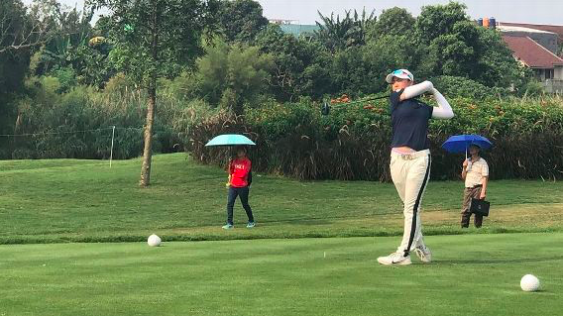 The women's team started the day two off second placed Korea and nine behind pace-setting China, but the double 66s for a 132 were more than enough as China shot a 145 and Korea could only manage a 137. The two golds were the first for the country in the golf competition of the Asiad since Ramon Brobio won the men's individual gold at the 1986 Seoul Games. The Philippines now has three gold medals to go along with ten bronze medals halfway through the quadrennial meet.